This picture is replete with a large number of images of people on it. The main number of people are ordinary children, who amuse themselves, blowing puddles of paper from ships, and scamper around with merry cries. In some places, as we see, the snow has not melted yet, therefore, children have the opportunity to ride on a sled, although it is unlikely that they will be able to play snowballs, as soon as you take it in hand, it melts right away, almost before your eyes. 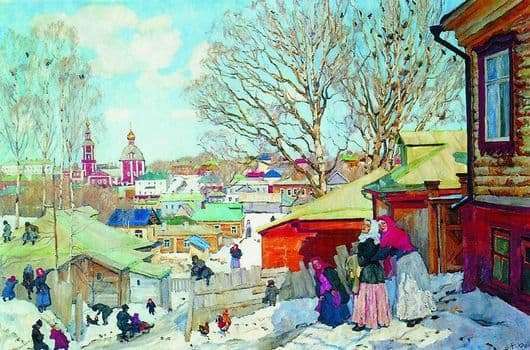 As for the author of the painting, Konstantin Yuon, after analyzing several of his paintings, it becomes clear that the master was very fond of depicting snow, and used various colors to express this more deeply in shades, highlights, or transitions from light to shadow and vice versa. As for the tops of the trees, they already see buds, which, literally in a few days, are ready to pop up, but for now the branches are completely bare. In the trees, you can see the birds, which, apparently, recently returned from the warm edges. The master was not afraid to choose complex compositions, which we can observe in this composition, where different scenes with people are depicted against the background of the landscape. In the foreground are two elegant girls standing on the porch of a wooden house of red-brown color. By their appearance, it can be assumed that they are two girlfriends, one of whom talks about her experiences, while the other one in turn tries to console her friend morally. Not far from them is another woman who is not without interest listening to their sincere conversation. Thus, the artist depicts in front of us a provincial situation, an ordinary daily life. The artist is very colorful and truthful, it turns out, to convey all the originality and simplicity of the everyday routine, completely from the other side.